There are loads of reality shows that are being hosted in television but there is a gap. This gap can be discovered only when your part of the industry but not when your an audience of this industry. 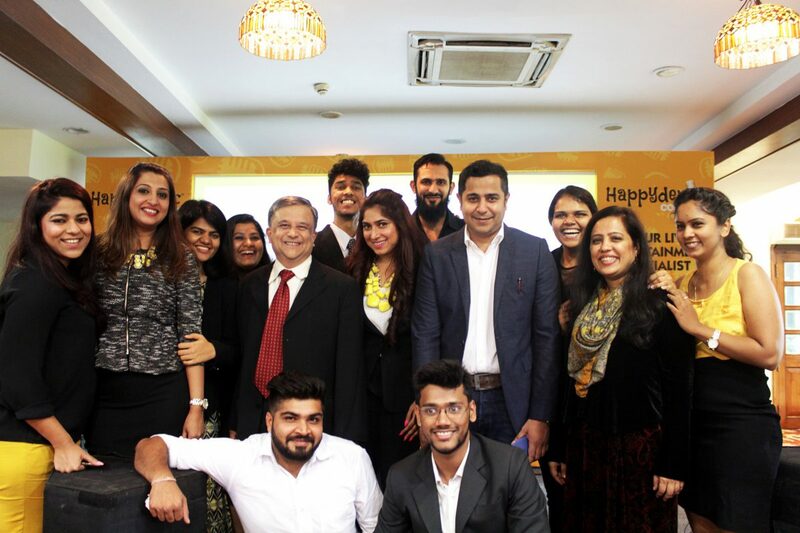 This week we interact with Mrs. Radhika Mukherji, Founder and CEO of Happydemic. Her startup Happydemic is a digital platform bridging gap between customers and upcoming artistes, ensuring a happy & soothing experience. She is also the wife of famous Indian playback singer Shaan (Shantanu Mukherjee). Radhika Mukherji is a thriving entrepreneur with creative instincts and passion for Music. Radhika uses her unique sense of technique and approach to resolve issues. Her primary motto is to enhance the joy of music enriching one’s soul, leaving a mark in the lives of the artiste and the audience by putting special focus on individual preferences. Along with her exquisite ambitions, she has a Business degree from N.M.College, Mumbai and a PPL license along with 8 years experience in Aviation. Additionally, in the last 15 years she has created successful IPs for Shaan. She is also a mother of two kids who believes in maintaining a fair balance between work and home and in her leisure time she enjoys swimming, outdoor sports & reading. Below is the interaction we had with her. 1) Happydemic solves the problem for upcoming artistes, is the foundation of this start-up inspired by your husband Shaan? I have been with Shaan for 20 years now, and I have seen him host a lot of reality shows, host them initially and then he moved on to judging them, and there was exceptional talent that came on to these platforms. So any reality show has a whole lot of rounds that go in, and you have over hundred kids with exceptional talent coming in but finally there’s one winner. So the idea behind Happydemic was to actually help the other 99, to bring their talent up, to not let them spiral down because they were as popular as their last season. A lot of these kids leave their cities, their villages and they come to Mumbai to pursue this dream of music, and like we all know that the city of Mumbai is such an expensive city, they have talent but nowhere to perform so the spirit of Happydemic came from there, that we wanted to be that gust of wind beneath their wings to help them get work and to connect their exceptional talent with honorable audiences. 2) You are already a celebrity, why did you choose to start-up? 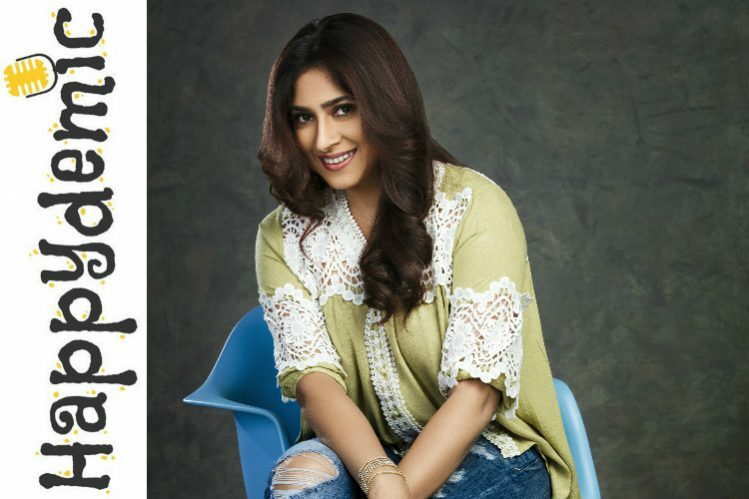 You know the whole thing about being a celebrity wife, there’s only just one thing to it, it’s called reflected glory and I love being Mrs. Shaan, but I think it’s equally important for me to be just Radhika Mukherji. So it’s not about turning into an entrepreneur, it’s not something that I’ve decided because my kids have grown up now let me become an entrepreneur, it’s whether you have it or not, right?. Everyone cannot be an entrepreneur and if you cannot run a successful company, you’re not an entrepreneur you’re a wantrepreneur. So I think that is probably a little harsh on celebrity wives saying “she wasn’t doing anything, that’s why she’s become an entrepreneur”, it’s not that. We’re well educated; we’ve been brought up by well by our parents. It’s just that we chose to stay home was because we have kids and we had a husband who was really working hard and hardly in town and I had not had kids to get them raised by a nanny. I wanted to raise my kids, so that’s why I stayed at home. And now that the kids are all grown up, I think that it’s only fair that I get a chance to prove myself. 3) How do you manage entrepreneurship and parenthood? Initially it would be very difficult I was always torn between the house and work it got actually quite difficult for me to manage because I have always been a hands-on mom and have been sitting at home for the past 13 years till one day I realised how well Shaan balances his personal and professional life and I mirrored that. There are 24 hours in a day and I decided to plan everything well in advance. I have from kitchen menu to meetings of the day, everything is planned well and I make sure that I stick to a schedule of the day. I actually imagine my entire day and I see whether it is practical for me to fit in the kind of things I want to do that day. It’s not so, then I give the things that need to be done priority. From kitchen menu to meeting schedule, chats of the kids’ extracurricular activities, car pool, even a date with Shaan …everything is planned! I have things to do notes all over my cabin in office and on the fridge in my kitchen.The only thing I have stopped doing is go to ‘show your face’kind of parties. I really don’t have time to socialise that much and the time that I have, I rather spend it with close family and friends. 4) Your profile does not specify you having technical background, how do you manage the technical part of Happydemic? Yes, I don’t have a technical background, but it’s just not the technical background that you need to run a creative company like Happydemic. Having said that, the whole technical part has been taken care of by our CTO, Mr. Lokesh Bhagwat, who has 35 years of experience in this industry. I just don’t look into a single thing, I like rolling on my job, sometimes I can be creative and sometimes I lay my hands on execution part of it. In fact, my company doesn’t even call me CEO, as in the Chief Executive Officer, they’ve named me the Chief Everything Officer. I am very open to learning, and I think I’m a very fast learner, so yes, I have grasped the ropes even on the tech front and I think I’ve become quiet savvy on that. Other than the whole technical aspect of staring a Start-Up you need a lot of hard work, vision, team work. You need to have timeline driven goals. You need to work hard, you need to stay focused and you always have to look for an opportunity where you can improve and reinvent yourself, and I think I have all of that. 5) What is your marketing strategy for Happydemic ? Our strategy to actually acquire clients would be Business – Business – Customers (B-B-C) like I said but more importantly we believe in Word of Mouth. Our talent is fantastic and we have a very systematic and transparent manner in which we deploy them. I think a customer gets immense sense of relief when he actually knows that it is a platform (a) that is transparent and (b) the talent is completely vetted. We vet our talent by our talent hunters or our coaches where they look at different parameters that would be voice quality, performance and presence. We make sure that all of them are matched well and that is one benchmark that we have here. We have a certain benchmark in which we attain our talent. When you have great talent and you have curated them well, you have mentored them well, they are ought to get a good audience. We only got clients mostly who are corporates as we go B-B-C but a lot of B-C has been completely Word of Mouth. 6) Where do you see this start-up in 10 years from now? 10 years from now I see Happydemic as a globally recognised brand. 10 years from now I know that every party will have live music as their entertainment option because we are going to bring it down to affordable prices. We also see ourselves diverging into different performing arts and handling that too. We see ourselves as one of the game changers in the live entertainment space of the country. 7) These days’start-ups exist only if they are supported by investors, what is fuelling your start-up? We have three angel investors, and Amar and I have boot-strapped ourselves. We are ultra conservative with our expenses caue we know it’s easy to blow up someone else’s money. We have invested wisely, technology, infrastructure and team in that order. Although a lot of VC’s have approached us, and we’re going through rounds with them, I don’t want to get into the whole number and valuation game. Sometimes the figures are just too large and I just find them a bit weird. So, we’re not in the number game, we’re here to prove a point, we’re here to be the number 1 in the industry where live entertainment is concerned. We’re giving it our all and touch wood; we should be breaking even within the first year itself, although the time was over a year to a year and a half. 8) Who is your role model? What are you doing to become like your role model? Indra Nooyi, she is my role model. She is, as everyone knows the Chairperson and the Chief Executive Officer Pepsi co. I love the way her career growth and career path has been while taking fantastic care of her family. She has beautifully balanced her time with her family and also taking care of her career. Read more Indian CEO Interviews.